Ideally located on the sandy/pebbly beach of Loutraki, a spa resort famous since antiquity, this Five-Star deluxe establishment is just one hour's drive southwest from Athens’ International Airport and with easy access to Epidaurus, Ancient Corinth, Nafplion, Delphi and Olympia. Inaugurated in 2002, the hotel’s structural concept is a feat of architectural ingenuity. The façade of the building resembles a cruise ship with round portholes, a bow and five “deck” floors, permanently floating on the beachfront. Beckoning with luxury, the 255 spacious guestrooms and 20 deluxe suites are luxuriously furnished and appointed with a all modern amenities, including air-conditioning, Satellite TV, direct-dial phone, Wi-Fi internet access, mini bar, safe deposit box, bathrobes and slippers, hair dryer, Jacuzzi bathtub and separate shower (sea-view rooms), and private balcony opening to splendid sea-views. The superb Suites complement the fine accommodation offered by this extraordinary establishment. From the larger area Junior Suites suitable also for private meetings, to the romantic Golden Sunset Suites with their panoramic views, supreme comfort is reached in the Royal Suites and their private outdoor Jacuzzis. 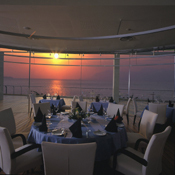 The hotel boasts three superb restaurants, the Lobby Lounge, the "Admiral" Bar, the "Sushiro" Bar and the "Rose" Bar. Fine dining, sumptuous a-la-carte or buffet menus, coffee, drinks and delicious desserts. Other services include laundry, dry cleaning and pressing, room service, complimentary car park, glass elevator with direct access to gardens, swimming pools and beach, beautifully landscaped gardens, pools for adults and children, fully organized beach with deckchairs, umbrellas, beach bar, water sports (in season) and a reception lobby with Wireless Internet access. Fully supervised the "Loutraki Pirates Club" for kids. 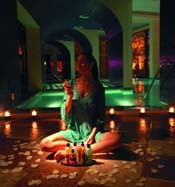 The "Oasis body and soul" wellness Centre with sauna, hamam, massage rooms & hydromassage. Hairdressing Salon, the gift shop "Luck" with daily newspapers etc. and the well known jewelry shop "Folli Follie" Shopping arcade with handicrafts and souvenirs. The Club Hotel Casino Loutraki is proud to present the Multi Purpose Conference and Banquet Centre, a complex of truly majestic and versatile facilities that offer the highest degree of flexibility and versatility. An area of nine hundred and twenty square metres complemented by State of the Art soundproofing and latest technology Audio Visual equipment, all meticulously planned to satisfy the needs of even the most discerning conference organizer. Conferences, Seminars, Product Launches, Exhibitions, Dinner Dances, Wedding Receptions and Fashion Shows are all attended to by experienced Banqueting personnel that will ensure the success of any function. 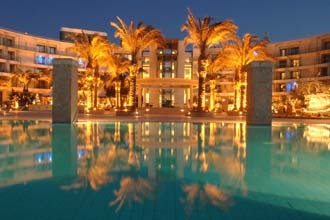 Virtually attached to the Club Hotel Loutraki Casino Loutraki lies one of the biggest Casinos in Europe. The most modern gaming facilities await to provide the thrill of trying one’s luck to professionals and beginners alike. 80 tables of Roulette, Black Jack, Caribbean Stud, Poker, Pundo Banco and 1000 Slot Machines. Complimentary beverages. The Casino is open 363 days a year – closed on Good Friday and Saturday before Orthodox Easter – 24 hrs per day.